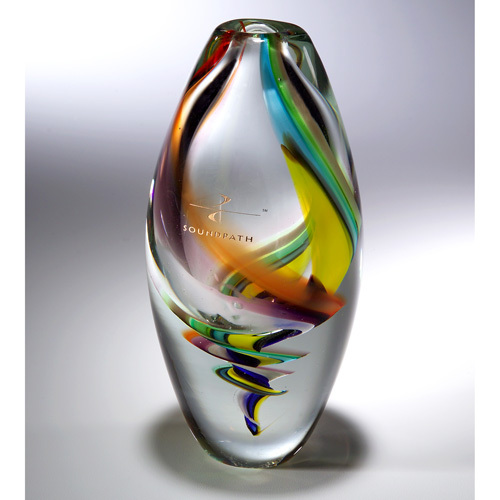 Sophisticant Art Glass Whether you're recognizing the employee of the month or awarding someone upon their retirement - The Sophisticant Art Glass Award will be sure to leave any recipient feeling appreciated.Say "Thank You" by presenting this beautifully hand developed piece. Its tall, sleek oval shape contributes to its elegance, while the gorgeous rainbow swirls completes the overall look. Standing at 8 3/4" x 4" x 4" - this sculpture is a must have! Bulk / 7 lbs. lbs / 3 pcs.